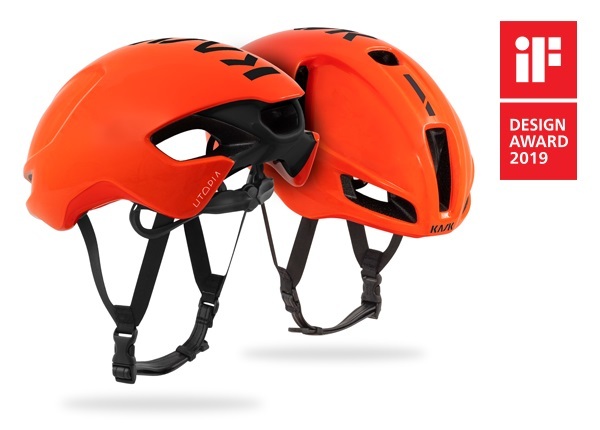 KASK’s industry-leading aero Utopia helmet has won the coveted 2019 iF Design Award in the Product category. The award is the second in two years for KASK, following the lightweight Valegro’s 2018 accolade. The judging panel was particularly impressed with the Utopia’s very latest thinking around aerodynamics and ventilation. Developed with Team Sky and worn by the squad during Geraint Thomas’ 2018 Tour de France victory, Utopia was designed using computational fluid dynamics (CFD) and tested extensively in a wind tunnel; the drag data of Utopia versus the best competitor helmet resulted in a saving of up to six watts when riding at 50kph. It can be used year-round in all climates, with nine expertly placed vents shaped to draw the air through the helmet at speed, while avoiding drag. For over 60 years the iF Design Award has been an arbiter of quality for exceptional design. An annual event, it is run by the world’s oldest independent design organisation, Hannover-based iF International Forum Design GmbH. The iF label is renowned worldwide as one of the most important design prizes in the world and submissions are awarded in the following disciplines: Product, Packaging, Communication and Service Design/UX, Architecture, Interior Architecture, and Professional Concept. Diego Zambon, general manager of KASK, said: “We are delighted that the Utopia has been recognized by the 2019 iF Design Award panel as a leader in its category.